Trad comic books publisher Archie has dabbled on and off with super-heroes. The first such iteration was contemporary with the “Marvel Age”, in 1961. This article describes the 1960s version of the Jaguar. There were further iterations as Archie took another stab at their super-heroes every 20 years or so. Group Affiliation: The Terrific Three, The Mighty Crusaders. Base Of Operations: A large U.S. city. Height: 6’1”? Weight: 200 lbs? Becomes as tough as “a rhinoceros’ hide intensified a thousand times”. Has “the strength of a million elephants” (which would mean STR 27 if you took it literally). Has the battering power of “thousands of buffalo”. Can endure cold like “a hundred polar bears in one”. And has “a thousand times the swimming skill of the otter”. He flies by means of twin jets on his belt, though they aren’t really a Gadget but more of a special effect. While fleeing from a giant dinosaur released by an earthquake in Peru, Hardy entered an ancient Inca temple. There he found a jaguar-skin belt. He would later learn that it was made by one of the great Primal Powers, gods who ruled the animals of Earth before the coming of humankind. Donning the girdle, Hardy uttered the magic words, became the Jaguar, defeated the dinosaur, and said his own name to turn back into Hardy. 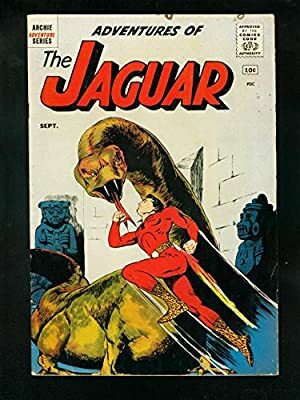 Thereafter Jaguar went on to become one of the premiere heroes of his world. Red body suit. Black, stylized jaguar face on chest. Jaguar skin boots and belt. 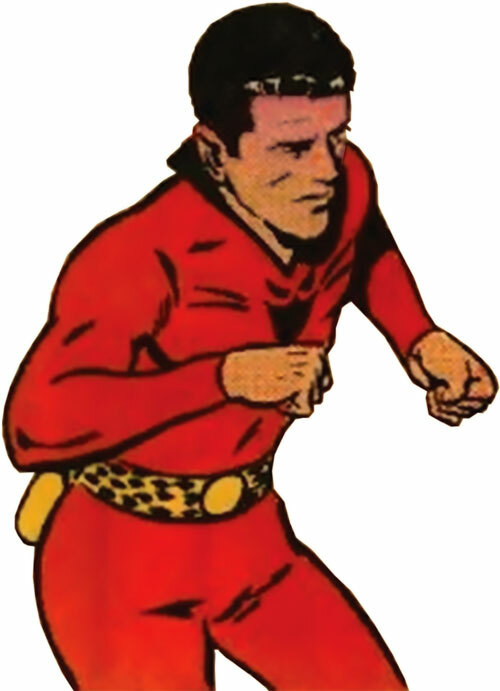 Jaguar is your classic “Goody Two Shoes” hero spawned from the early 1960s. He is a real boy scout and is very much his world’s Superman in attitude and power level. The “Primal” Powers may be the Lords of Order and Chaos. Some link to the Tantu Totem possessed by Vixen may be established. There may be a case for Jaguar to possess Animal Mimicry: 20 and a Power Reserve: 10 that only works with Mimicked Powers. Flight is only used at a 10 in Atmosphere. Sealed Systems is ineffective vs. Gas and Radiation Attacks. Skin Armor may be ignored by a Trick Shot. Area Knowledge (Peru), Insta-Change, Scholar (Zoology). The Terrific Three (Low), The Mighty Crusaders (High). Alter Ego (controllable), Dependent (Jill Ross, girlfriend/secretary), Loss Vulnerability (Reverts to Ralph Hardy if stripped of Jaguar Belt), Secret ID. “NUCLEON ENERGY” BELT a.k.a. JAGUAR BELT [BODY 20, SPIRIT 20]. Source of Character: Archie Comics.